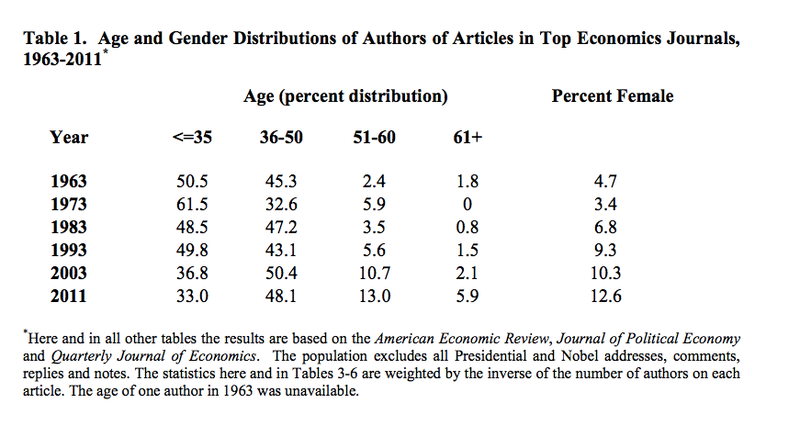 Presenting data on all full-length articles published in the three top general economics journals for one year in each of the 1960s through 2010s, I analyze how patterns of co-authorship, age structure and methodology have changed, and what the possible causes of these changes may have been. A new paper by Daniel Hammermesh. He examines the QJE, AER and JPE. Authors are getting older. And now just 87.4% male dominated instead of 95.3%! And apparently we are getting more empirical but less likely to use existing data (in spite of the Internet!). this is interesting! is the implication that field work is becoming sexier, that there is a publishing bias toward having ‘new’ and ‘your own’ data, that field experiments are fun because the data collection is potentially harder but the analysis is potentially more straightforward… or that ‘standard’ datasets like DHS and LSMS (at least for dev econ) need an update to be more useful for the types of questions people want to ask now? 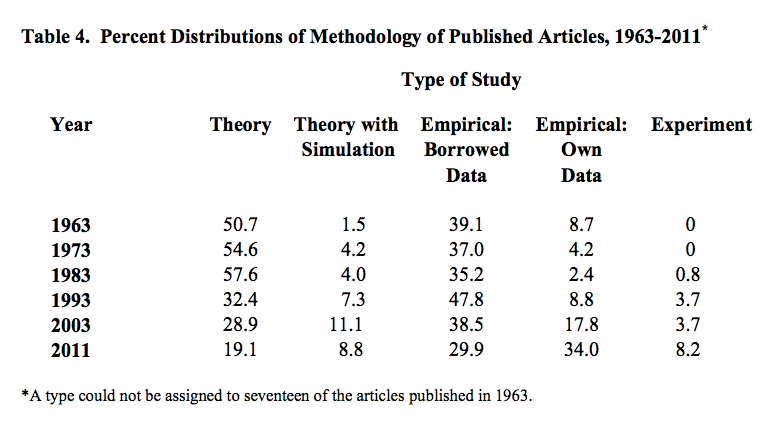 presumably, the move towards empirical field work and the decline of the use of theory are linked phenomena?